Is this a statue of John Paul II, or is it rather Benito Mussolini? Pope or Mussolini? The Roman Catholics in Rome are still puzzled. The Roman Catholics in Rome, have been up in arms over this statue. It was made to honor the late Pope, but rather looks like the man who gifted the Vatican statehood to the Pope in 1929, Benito Mussolini. Some have said, there is hardly any difference between these two men in the first place, so why bother? But what about the empathy space inside the body? What exactly is that kind of symbolism? A new 16 foot tall bronze statue of Pope John Paul II was recently unveiled in the piazza of Rome’s main train station to a public outcry. 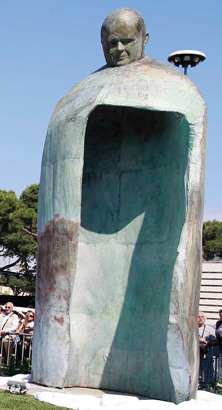 Some of the public dislike it because they feel it is a poor likeness of Pope John Paul II, most just try to make a joke about the empty cavity and the style, but many have said it looks like Mussolini, the much hated Italian dictator from 1925 to 1945. Some worry that the many homeless who hang around the train station will make a permanent shelter out of the cavity of the sculpture or it will fill with trash. More than likely this controversy is just a much needed diversion from the political and economic scandals in Italy today. I am not an expert on arts. But I have an objection to if skulpturs by nature are venerable, and adorable. Who decides what the public should adore? If the present Pope calls his faithful to light candles and pray in front of this sculpture, the Catholics are caught in a fix. To whom are they praying? 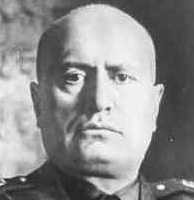 Would the fascist leader Benito Mussolini also listen to their prayer in the “Catholic heaven?”. Who would ever want to sculpt such a gruesome monument?? If you haven’t guessed it, then does the following article match with the above monument – — by all means it does!! Ever heard of the IRON VIRGIN … well, take a look … and be prepared for more ghastly stuff. This was a grand link. I will make a story. Blessings. I’m glad you found the link useful. Why would they ever think of sculpting this thing out of metal (bronze)? … do you see what I see? Hi, (I know I need glasses) but the empty cavity looks like the number 7. I was thinking more like a bomb shelter. Like they have in Sderot. Can this “bunker pope”, take an incoming Kassam? You definitely need glasses LOL! That’s a shadow of something in the cavity … Maybe Kassam #7?? Check again. Lol! This sculpture represents what every believer does not want to be: empty. Devoid of the Holy Spirit and empty so that evil spirits can enter in. .. but without a door for cover and protection, what good would that be??? … And what if the Kassam dives straight into the cavity??? LOL! !